Protects gas analyzers from dust and excess moisture. Model 3434 (left) has 5 micron teflon hydrophobic membrane. Tubing ends fit into 1/8" (3 mm) ID tubing. 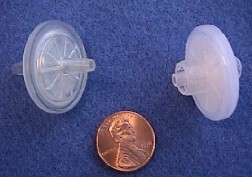 Model 3435 (right) has 25 micron teflon membrane. Male/female luer connectors.